NEWS SUMMARY: Society of Jesus Agricultural and Social Institute (SOJASI) at www.sojasi.org is doing fine, with Cecilia George as director. 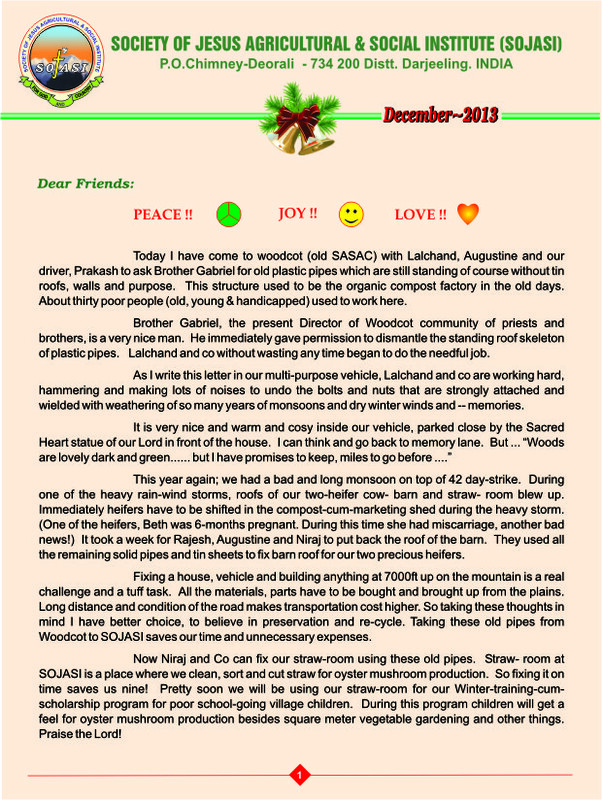 Himalayan Hope and Welfare Society (http://www.himalayanhope.org/) is also doing well, with Sudhir as the head. Canadian friends and supporters have continued to visit Kurseong. To donate: Go to our menu pages for both organizations for instructions. MISSION of THIS WEBSITE: To see that the work started by the Saint Alphonsus Social and Agricultural Centre (SASAC) continues for decades into the future to provide whatever the poor need—food, clothing, shelter, employment, medicine and education—to free themselves and their own poor communities from the prison of poverty. 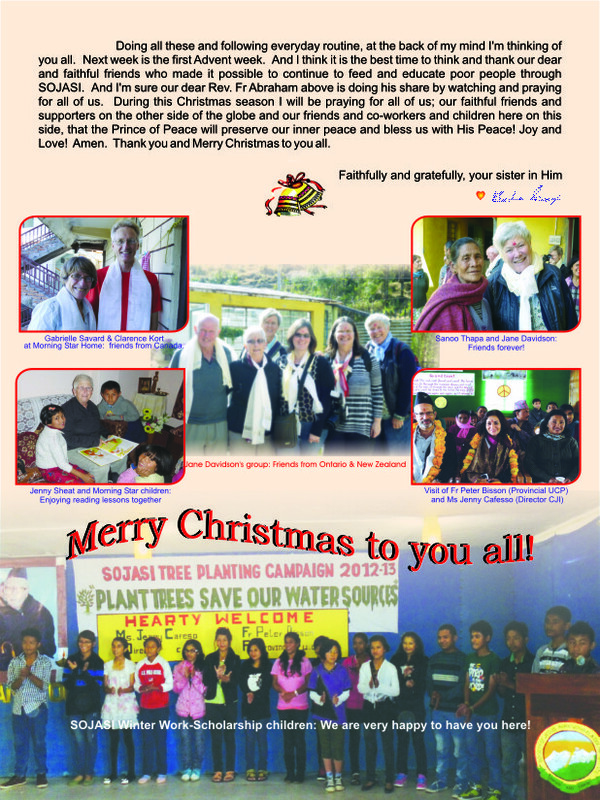 BACKGROUND: SASAC is the collective effort of thousands of the poor in Kurseong (near Darjeeling, India) and currently over 1,000 individuals and families around the world (mostly in Canada), led by Fr. Murray Abraham, SJ, who first started working there in 1959. (After serving as headmaster at St. Alphonsus School, he started SASAC in 1975.) Through the years, SASAC has brought together people from across the world for the common goal of working together to help the poor raise themselves out of poverty. In the process it has tested and proven many ways to accomplish this, with projects in education, agriculture, animal husbandry, forestry, house building, appropriate technology, and many more. Until April 2006, SASAC continued to grow, but then a financial crisis arose in part due to the Indian government’s stricter enforcement on rules affecting foreign funds flows that affected the host organization, the Jesuit Province of Darjeeling. Since then, SASAC and other DJP projects suffered from the stoppage of donated funds. At SASAC, all operations were virtually been halted and workers laid off or left. The SASAC Supporters’ Coalition organized quickly as a global group of supporters and donors working first to identify the facts, and then identify ways to help revive the work of serving the poor. The Coalition ended in 2011, but members continue to communicate and support the projects and activities in Kurseong. Fr. Murray Abraham SJ, passed away on 28 August 2012 at Sr. Ann Francesca’s Flame of Hope residence in Matigara and was buried in Kurseong. Memorial events were held in the autumn that year in several locations to honor and celebrate Fr. Abraham’s life, work and his dedication to serving the people of Kurseong in Darjeeling District, India. See our Archive page for details. Questions? Please contact Canadian Jesuits International at cji@jesuits.ca or call toll free 1-800-448-2148. CJI is accepting donations in the memory of Father Abraham, to support SOJASI, the Society of Jesus Agricultural and Social Institute. Louder than Words from Blue Planet on Vimeo. SOJASI Update (Kurseong, West Bengal, India) Fall 2011 from Blue Planet on Vimeo.